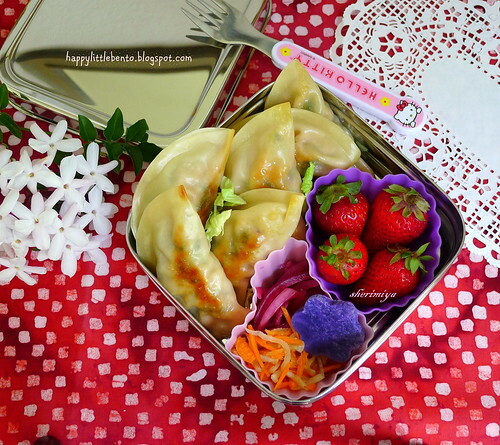 Gyoza EcoLunchBox Solo Bento, a photo by sherimiya ♥ on Flickr. I made a giant truckload of gyoza (see my method and recipe here) tonight; enough for 20 per person... or so... but of course, some of them were destined for bento so we didn't actually eat that many. I could have, though! These were made with ground pork and turkey, green onions and chopped swiss chard. Because I'm just that untraditional. I packed as many as I could fit in the EcoLunchBox Solo Cube, which is perfect for this kind of "dry" meal, alongside the last few remaining baby strawberries, pickled onions, carrots and daikon, and a small Okinawan sweet potato. My kindergartner can handle this easy-open box, secured with a felt band, and it's just the right size for her appetite as well. Enjoy, TinySprite! So cheery and fun, with a savory sounding filling...go gyozas!